Personal prophesies for individual Believers... encouraging, uplifting, comforting. Prophetic words for the corporate Body of Christ. How to enter the prophetic realm of the Holy Spirit. 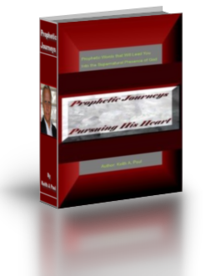 This Prophetic Journal will not be a sit down and read it through in two sessions kind of book. You will benefit most from its contents as you read, meditate, pray and spiritually digest what the Lord is saying. I have not dated the content so you can reference what the Lord is saying through its pages on any occasion.